Reported in multiple filings published by the U.S. Securities and Exchange Commission on Tuesday, the vested stock awards date back to Mar. 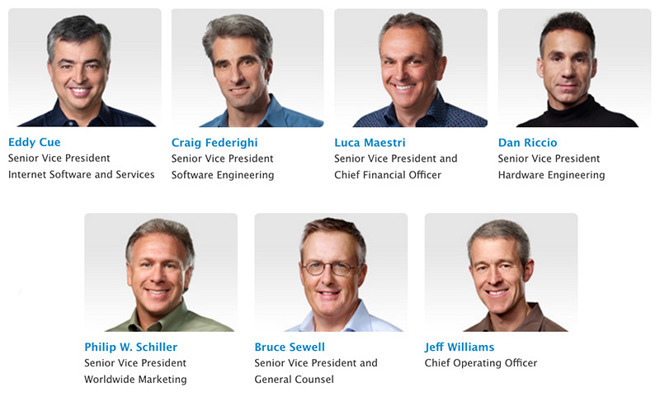 3, 2014, when Apple awarded the execs 44,912 RSUs (adjusted for Apple's 7-to-1 stock split). Like past performance based awards, zero to 200 percent of the RSUs were set to vest on Oct. 1, depending on total shareholder return relative to other S&P 500 companies during the period between Sept. 29, 2013, and Sept. 24, 2016. Along with Cue and Schiller, Apple SVP of Software Engineering Craig Federighi, SVP of Hardware Engineering Dan Riccio, COO Jeff Williams, and SVP and General Counsel Bruce Sewell were included in the 44,912 RSU incentive plan. SVP and CFO Luca Maestri was granted a target number of 7,749 RSUs, which last week converted to 10,694 vested shares. To see their respective awards vest in full, or effectively double, each executive had to help Apple achieve a relative TSR performance ranked at or above the 85th percentile for companies listed in the S&P 500. If Apple ranked above the 55th percentile or 25th percentile, a respective 100 percent or 25 percent of the target RSUs would have vested. For the three-year period between 2013 and 2016, Apple's TSR was pegged at 69.27 percent, putting the company in 77th place, or the 83rd percentile, among the 458 companies included in the S&P 500. Apple withheld 43,809 shares from awards received by Cue, Schiller, Federighi, Riccio, Williams and Sewell to satisfy tax laws. The company did the same for 5,371 shares of Maestri's award. Cue, Schiller and Williams transferred their shares to family trusts, while other reporting executives kept the vested bonus in caches of directly owned Apple stock. Today's SEC filings come less than two weeks after Cue saw $59 million worth of RSUs vest as part of a 2011 award, and a little over a month after CEO Tim Cook cashed in $65 million worth of recently vested RSUs in a pair of transactions. The chief executive in August celebrated five years on the job, unlocking 1.26 million RSUs in a performance- and tenure-based compensation package.